How did the early American Baha’i institutions deal with issues of race and racism? In a Faith dedicated to the oneness of humanity, what role did those controversial issues initially play? For every era hath a spirit; the spirit of this illumined era lieth in the teachings of Baha’u’llah. For these lay the foundation of the oneness of the world of humanity and promulgate universal brotherhood. – Abdu’l-Baha, Selections from the Writings of Abdu’l-Baha, p. 109. For at least one historical response to race relations in America, let’s look at a letter the National Spiritual Assembly of the Baha’is of the United States and Canada (“NSA”) sent to a wealthy African-American, Mr. Dana A. Dorsey, in response to his request for advice about what he could do to advance activities that would help other African-Americans. This letter, sent in 1926 from a democratically-elected NSA that had only been in existence for three years, gives us some clues about how the early Western Baha’is dealt with the ugly realities of the blatant racial prejudice of the period. It was our privilege on Monday last to meet with Mr. Howard MacNutt and learn from him of your interest in the Baha’i teachings and your desire to establish some activity of permanent usefulness to the members of your race. We understood from Mr. MacNutt that you wanted some suggestions from us for you to consider in this matter and we advanced several ideas which Mr. MacNutt will transmit to you direct. The members of the National Spiritual Assembly instructed me to express to you our cordial thanks for this opportunity to assist even indirectly in an effort which we feel certain will have great importance and be a vital factor in bringing about of better social and spiritual conditions in this country which we also ardently desire. If we can be of any further service to you I hope you will feel free at any time to turn to us for any cooperation that lies in our power to extend. – National Bahá’í Archives, United States, Office of the Secretary Records, Files on Individuals 1925–1929. Courtesy of Edward Sevcik, Archivist, May 14, 2018. From the letter itself, we know that Howard MacNutt had personally met with the NSA. What is significant—and historical, in its own sense—is that Howard MacNutt had faithfully conveyed Mr. Dorsey’s request for advice to the NSA, and that the NSA responded in a remarkable way. The NSA’s response quietly resounds with dignity, respect, and consideration for Mr. Dorsey’s request for “some suggestions” in response to his “desire to establish some activity of permanent usefulness to the members of your race.” Since the NSA’s recommendations were transmitted through Mr. MacNutt to Mr. Dorsey directly, we cannot know the exact nature of the NSA’s recommendations—and chances are that subsequent circumstances did not permit their implementation. The storm tide on the Miami side of Biscayne Bay was approximately eight feet, and reports indicate a similar tide at Miami Beach. The water front of Miami was flooded for two to three blocks back from the bay, and low parts of the city near the Miami River were also flooded. After the storm, the entire bay front section of Miami was strewn with boats ranging in size from small pleasure craft to large schooners. Some of the boats had been carried more than two blocks from the bay. Water rose in hotels and residences near the bay to a depth of three to five feet. Miami Beach was entirely inundated, and, at the height of the tide, the ocean extended to Miami, three and one-half miles across Biscayne Bay. All streets near the ocean at Miami Beach were covered with sand to a depth of several feet, and in some places automobiles were entirely covered. The foundations of some buildings were washed out, allowing the buildings to collapse. The storm tide occurred with the shift of the wind to the east and southeast, following the arrival of the center of the storm. In the Miami River, the tide came in the form of a bore that left a mass of wreckage from the boats that had sought safe anchorage. The intensity of the storm and the wreckage that it left cannot be adequately described. The continuous roar of the wind; the crash of falling buildings, flying debris, and plate glass; the shriek of fire apparatus and ambulances that rendered assistance until the streets became impassable; the terrifically driven rain that came in sheets as dense as fog; the electric flashes from live wires have left the memory of a fearful night in the minds of the many thousands that were in the storm area. – Richard Gray, quoted by Charles L. Mitchell, “The West Indian Hurricane of September 14–22, 1926,” Monthly Weather Review Vol 54, No. 10 (October, 1926), p. 412. Then, two months later, tragedy struck again—Howard MacNutt was hit by a motorcycle while on his way to a Baha’i meeting in the African-American section of Miami on December 23, 1926. He died three days later of internal injuries. 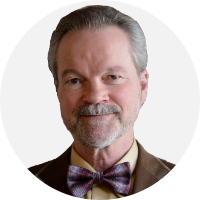 We will never know whether or not Mr. Dorsey was able to implement any of the Baha’i administration’s recommendations, for two obvious reasons: first, we do not know what the NSA’s recommendations to Mr. Dorsey were; and second, we have very little information as to Mr. Dorsey’s activities, whether personal or public, especially during this period of interest of 1926 to 1928—when his name first appears on the Miami Baha’i membership list. Suffice it to say that the National Spiritual Assembly of the Baha’is of the United States and Canada took Mr. Dorsey’s request for advice seriously, and obviously spent significant time consulting as to what specific ideas would be worth recommending to Mr. Dorsey. Presumably the NSA’s letter was sent in advance of Mr. MacNutt’s return to Miami. So, between the Great Miami Hurricane of 1926 and Mr. McNutt’s premature, accidental death on December 26, 1926, Mr. Dorsey had little time or opportunity to put the NSA’s ideas to practical use. These ideas presumably were timely—or perhaps ahead of their time. But perhaps even more significant is how the NSA’s letter to Mr. Dorsey reflects on this elected Baha’i institution itself. The letter, upon closer examination, is subtly remarkable, especially for its era. 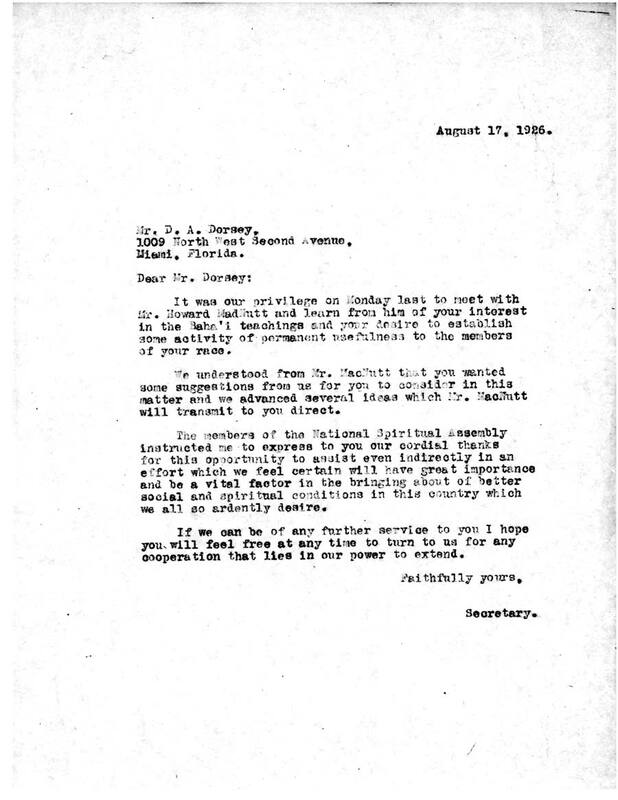 In its own unostentatious way, the National Spiritual Assembly’s reply to Mr. Dorsey was gracious (expressing “our cordial thanks for this opportunity to assist even indirectly”) as well as substantive (indicating that “we advanced several ideas which Mr. MacNutt will transmit to you direct”) and perhaps even visionary (contributing ideas to assist Mr. Dorsey in his “effort which we feel certain will have great importance and be a vital factor in bringing about of better social and spiritual conditions in this country which we also ardently desire”). The NSA, moreover, exemplified a dignified humility (in offering to be of “any further service” to Mr. Dorsey) and an exemplary openness in its broad offer of further consultation and cooperation (in inviting Mr. Dorsey to “free at any time to turn to us for any cooperation that lies in our power to extend”). This humble, yet dignified letter on the part of the National Spiritual Assembly of the Baha’is of the United States and Canada alludes to a proud moment in early American Baha’i history. The NSA’s letter speaks volumes about the sincerity, quality, integrity and progressiveness of this esteemed Baha’i institution—and shows how Baha’u’llah’s teachings of racial equality and justice affected even the earliest Baha’i institutions. Whenever I see the writings of Shoghi Effendi and the messages from the Universal House of Justice or National Spiritual Assemblies, even to just one individual person, I wonder how they even had to time to write them. The unearthly eloquence and balance in how they do are examples any secular writer would die to reach. Maybe "unearthly" is really the right word, because the majesty of these messages should be enough for many inquiring minds to wonder if they're inspired and assisted from a higher realm!